Polaris calls it Khaos, which is the Greek spelling of English word Chaos (from Latin) which means Chasm—a marked division, separation or difference. And Khaos is different. Polaris has been wrestling with trying to make its rigid suspension a little more flexible and rider-friendly. Yet, the company maintained that the Polaris 850 Pro RMK was the best mountain snowmobile ever built. So if you’re already the best, how do you improve? 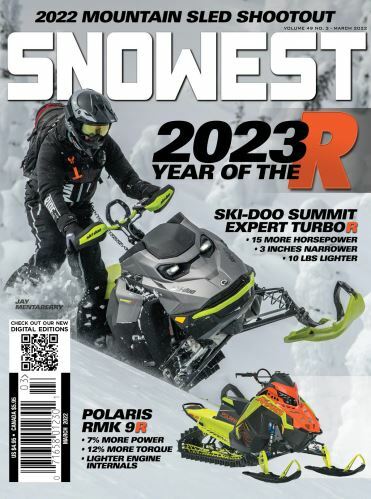 Polaris engineers realized that not all snowmobilers are looking for a sled that can ride on the edge in extreme terrain—and most snowmobilers claim to be “extreme” riders. Many are looking for a sled that handles well in all riding conditions … not just those in the deepest and steepest conditions. They want a sled that will “bridge the chasm” between the extreme and the day-to-day riding conditions. The 2020 Polaris Khaos has been designed to be more flexible and easier to initiate a turn than the Pro RMK. But since it’s easier to turn, that means it takes a little more effort to hold a line—you have to give and take. Polaris recognized that the competition was focusing on the ease of turning. And the company realized that a growing number of the demographics was getting older and a little slower. The Khaos was designed to be the most agile mountain sled on the market. It features an aluminum over-structure and rear bumper for greater durability; Walker Evans Velocity Hi-Lo Compression Adjustable Shocks in the rear for a smoother, more adjustable ride; a new rear suspension geometry for easier transitions; React forged A-arms and spindles for strength and durability; and Walker Evans Velocity front shocks for predictable handling. The Khaos is designed for all parts of the mountain … not just the deep powder. A lighter front end allows it elevate on top of the snow faster, allowing you to pop over fallen logs. You can actually wheelie up and clear the log with the front of the sled and allow the track to absorb the bounce as you pivot over it. The new rear suspension geometry provides the ultimate weight transfer that you can initiate with the throttle. The Walker Evans Velocity shocks are adjustable and easy to tune with a twist of a knob. Polaris offers two track options for the 2020 Khaos—a 2.6-inch Series 6 for outstanding traction and durability in all conditions and a 3.0-inch Series 7 for off-trail performance in deep snow conditions. The React Front Suspension features an adjustable ski design that allows you to go from a 36-inch ski stance to a 38-adjustable ski design. It has effortless sidehill initiation, making it feel lighter for less rider fatigue. The Khaos will feature the similar Snow Check customization options: manual/electric start; low/mid windshield; track options; color (red, black, plum); handlebars (low, mid and high); gauges (Digital and PIDD).